The point of greatest eclipse (totality phase during 4 min 9 sec) was located in the middle of the Pacific Ocean east of Indonesia where about 10 million people lived inside the totality path. To observe the 2016 March 8-9 total solar eclipse, I proposed tours only in eastern Indonesia, in the Northern Maluku, where the ground weather prospects were the best and the duration the longest. However the local infrastructure was fairly limited. The Woleai atoll, belonging to Micronesia, was offering the longest land-based duration very close to its maximum but its airstrip was out of order so the logistics would have been far too complex. There were numerous viewing locations along the path, however paying close attention to the weather patterns and local terrain topography was mandatory unless you were on a cruise ship in the Pacific Ocean where the sky was usually clearer. Moreover the 2015-2016 El Niño episode did somewhat improve the weather prospects in Indonesia. Thanks to the Ministry of Tourism and Creative Economy and the various local authorities for their help. 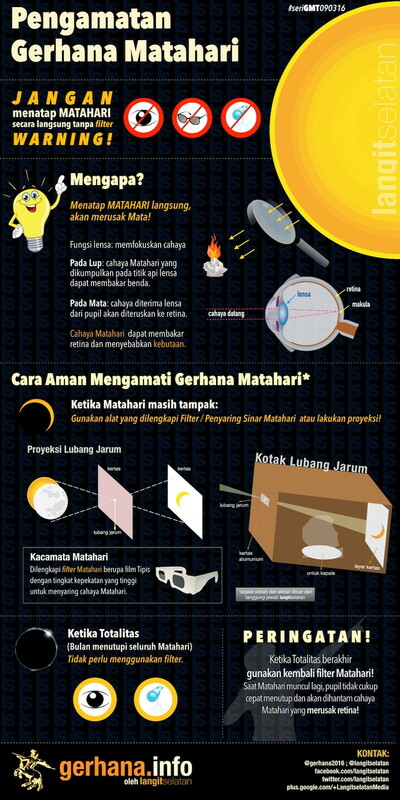 Page "Introduction" | Page "Scouting" | Page "Eclipse" | Page "Google Map" | Page "Weather" | Page "Gerhana Matahari"
Instructions in Bahasa Indonesian to observe the solar eclipse thanks to my friends at LangitSelatan "The Southern Sky". 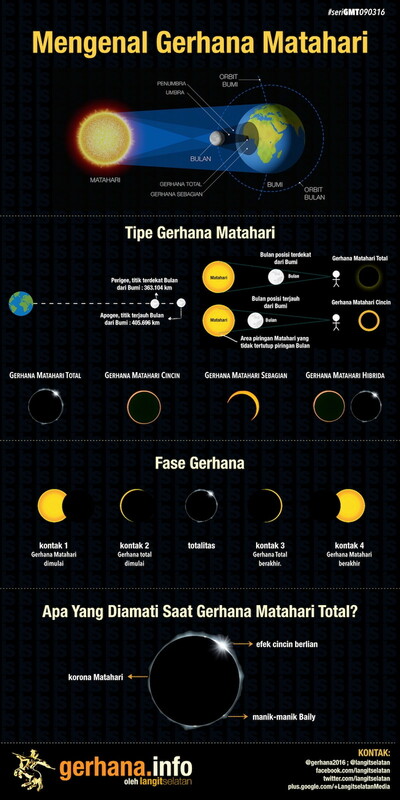 There is also the interactive eclipse map in Bahasa Indonesia to help local readers. Last page update on December 28, 2015.